From June 15 to June 22, 2014, ‘A Walk For Mother Earth’ continued the journey of ‘Peoples for Mother Earth’ (‘Les peuples pour la Terre Mère‘). They walked 140km over 8 days, from Kanehsatà:ke (or Hudson QC) to Ottawa ON, to continue efforts to oppose pipelines here and elsewheres. 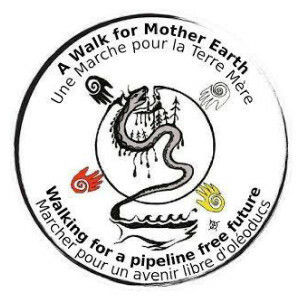 The original ‘Les peuples pour la Terre Mère’ walked from Cacouna QC to Kanehsatà:ke, from May 10 to June 14, covering approximately 700km. It followed the route of the planned TransCanada Energy East pipeline to Montreal, and then the route of the already-approved Enbridge Line 9 pipeline to Kanehsatà:ke.